Tons of Zine Reviews! | Robert Mitchell Jr.
Now that I’ve had a chance to sit down and actually read the zines I picked up at DC Zinefest last weekend, here are some quick reviews (clockwise from upper left in the photo). Next we have two pieces from the G. E. Gallas collection. The first is The Poet and the Flea which, like Mt. Olyphant, is a graphic novel being released in installments. How in the world could you not love a graphic novelization of the life of William Blake? Holy Urizen! I’m no Blake scholar, but I’ve got my feet wet on the subject of England’s mad poet, and Gallas is doing a banging job. And the courage to tackle Blake! Are you serious? One of the most studied poets in history? This thing is fascinating, and she clearly loves her subject. “A tree filled with angels, their light blinding, their wings bespangling every bough like stars.” Go and get some. (A+). The second piece from G. E. Gallas is The First Reich. This teaser for a graphic novel in development is written by Shannon Brady and illustrated by Gallas. It tackles the subject of the whacko genius Wilhelm Reich. For those of you who are unacquainted with Reich, he was a highly educated and respected psychoanalyst who also believed in a cosmic energy known as “orgone.” Because Reich’s writings are the only ones ever ordered to be destroyed by a U.S. court, he is a darling of the occult and conspiracy theory crowd (and how do I know this? Back when I joined the Richmond League of Occult Research and Education they had just finished building an Orgone Cloud Buster based on Reich’s plans). I love the subject, and both writing and artwork are solid. Recommended (A). One of the biggest surprises this year was the stuff I got from Kelly Chick. I liked everything I picked up — a vertical folded booklet called Stop Having Boyfriends (“we made too much eye contact for it to ever be platonic/i always get out of the car just a little too fast”), and two quarter-sheet booklets called dear kelly…love kelly and Contextual Awareness (“you just want someone to rub your head until you fall asleep”). She tabled next to me and she was charming. She gave away a whole backpack full of free stuff. People like her reinforce my belief that life is completely not pointless. No website listed. Maybe if you email her she’ll send you stuff. That’s all my reviews for this year! This entry was posted in Writing and tagged blake, chick, fpoon, gallas, graphic novel, Lapczynski, olyphant, poetry, queer witch, skelley, stacks, ziemba, zine. Bookmark the permalink. Gee whiz, you don’t have to thank me! 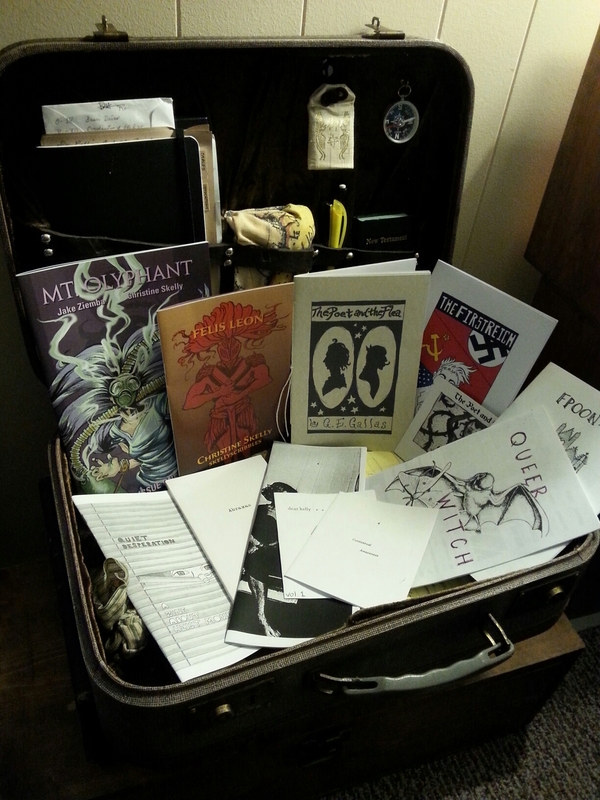 Pingback: I’ll Review Your Zine | Robert Mitchell Jr.